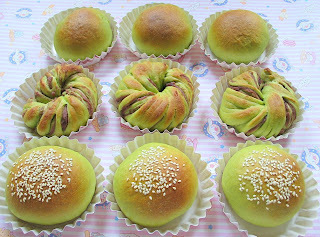 I found a green tea bun recipe from the cookbook "Bread Magic". However, the bread is a little too time consuming to make...u'll need to make the bread dough, and then another smaller portion of bread dough as topping, i.e. to be wrapped around the main dough. As I couldn't afford to spend too much time on this, I simply followed the basic sweet dough recipe from the same book and added in 1 tablespoon of green tea powder. I didn't know whether this would affect the outcome of the bread, but since the ingredients to be used are relatively cheap and available, I felt I could take the risk without much regret! I left the bread machine to do the kneading and let the dough rise at room temperature. Shaping the dough was quite easy, as I made most of them into round buns. I also tried adding sesame seeds on a few buns just to have some variation. The buns turned out to be rather soft...although I couldn't taste the green tea flavour; and the red bean paste was slightly too sweet for my liking. Note: The buns didn't taste good after leaving them overnight. Had to warm them before serving...otherwise the bread tasted a little dense and "doughy". Not sure whether it was due to the green tea powder or the red bean paste?? Will remove the recipe which I had posted here yesterday. I received a few requests for this green tea buns recipe be posted, despite the fact that I wasn't sure why the bread didn't keep well. I have now posted the recipe below so as not to disappoint those who are keen to give it a try. Place water, egg, butter, followed by caster sugar, salt, bread flour, milk powder, green tea powder and yeast into the pan of the bread machine. Set to Dough function. When the machine completes the kneading cycle (20mins) remove dough from the bread pan, let it proof in room temperature in a mixing bowl, covered with cling wrap. Allow the dough to proof for 60 mins or until double in bulk. Alternatively, you can leave the machine to complete the full Dough cycle (knead and proofing) which takes 1hr 30mins. Take out the dough and punch out the gas produced. Divide the dough into 50g portions. Shape into rounds and let rest for about 10 mins. Flatten rounds and add fillings as desired. Shape into rounds or as desired. Arrange dough in a greased or lined pan or use paper liners. Let rest for about another 30 mins. If desired, top doughs with sesame seeds. Bake for about 15 minutes in a preheated oven at 180 degC. Hi I love azuki bean paste! I've been looking out for green tea recipes cos I got green tea powder recently too. Hi HHB! Your buns looks absolutely gorgeous. I do admire your bread making skills...your a pro! Anne, you are too generous :) I am certainly far from good, not to mention a pro! It just happens that this bread dough was quite easy to shape...I am sure you can do a much better than me! btw, this bread didn't taste as good when left overnight...got to warm it before eating...otherwise it tasted a bit "doughy"?! They're so pretty! Yr bread shaping skills have improve so much, I especially like the twist one. And the browning is done so perfectly! Wah! Fancy looking buns! Especially the swirly ones!!!!! They certainly look very good and tempting......cannot be done without a bread machine, right???? vb, no, you can make this by hand...I only used the bread machine to do the kneading...too lazy to knead by hand, haha! your buns looks ok, do you mind share the receipe again ? 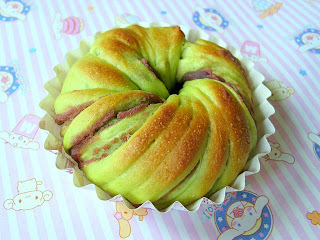 I'm really keen to make green tea buns & other green tea related recipe. I got mine from Isetan Scotts recently, is in a small dark green tin container (S$5+) at the japanese tea shelf, I used it for matcha chiffon ,the aroma & taste was really good but don't expect a bright green finishing. But aft 2nd attempt ,my sponge still not perfectly rise (partly dense), would you like to give a try ? Do look out for the temperature ,it seems abit low for me . 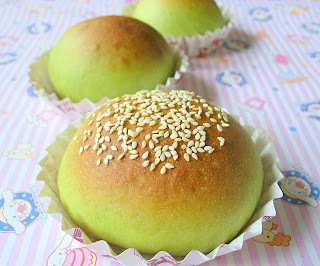 Your green tea buns really look very tempting. Very skillfully shaped! I do wanna try this out but I'm still contemplating because you said that these buns don't keep well. 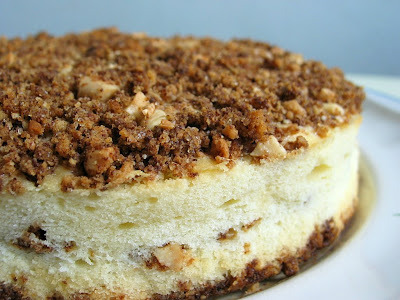 Do you think it's the recipe (source)? Coz I read that your Pullman's bread also turned out denser and chewier the next day using recipe from the same source. I hv the book and tried hv tried the Panettone recipe. I dunno what happened, but mine didn't keep well too. Hmmm... Just wondering, have you tried other recipes from this book? Hi Shiyan, hmmm, I am really not sure what happened...it could be the bun recipe, it would also be the green tea powder or even the red bean paste. I have not tried the other recipes from the book though. btw, I just got a comment from another blogger who suggested that I should keep the bread in an airtight container (I just keep them in plastic bag), and the bread would stay soft. If you are really interested in making something using green tea, maybe you can use a sweet bun recipe that you are comfortable with, and add in 5g of green tea powder. I don't have any scale to weigh the yummy ingredients you provided in the recipes. Could you advise what I can use for replacement like measuring spoons, cups, etc.? Hi Anonymous, I always use a scale to measure ingredients,as I prefer to follow the metric measurements. You can always use a measuring cup or spoons. But you will have to convert it to cups...if the recipes are in metric. I use a very cheap diet scale as I dont do huge quantity...it's only up to 500g, and it cost under $8 (are u a local? I got it from OG). 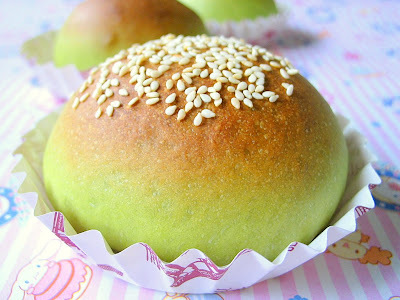 i was looking for recipe on bun and happened to bum into your green tea bun although you had posted ages ago. It looks so yummy and nice! So i tried using the recipe but instead of green tea, i subsituited with cinnamon powder. i used my bread machine to do the dough for me (1 1/2 HR) but you know what, the dough was so sticky and soft that i couldn't even roll into a ball even though i tried using more flour. In the end i just left it in the bread machine and finished off the job for me. So i had a loaf bread instead of bun.. ha, ha, ha. What do you think? why it is so sticky and muddy? Thks anyway. i love your blog! Hi Christie, the dough for this recipe shouldn't be wet and sticky. I'm sorry, as there are many possible causes, I can't really comment on it. However, I suspect you may not get the measurement of the ingredients right? Where did you buy the Green Tea powder? i've been looking for some for a green tea frosting Im planning on using on some vanilla cupcakes, but i dont know where to get it. Trader joes? Walmart? Hi Stephanie, I get the green tea powder from our local supermarket here in Singapore. You may try Asian grocery stores in the States. I am using this brand "Ujinotsuyu Matcha Hagoromo", I did a search, and apparently you can order it online. Thanks for sharing. May I know, where I can find the book (Bread Magic)or the ISBN ? Hi, you can get the book from Popular bookstore. 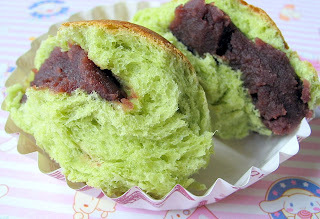 can order green tea bun from you? its making me hungry! Noted that you have used both Phoon Huat and the other Japanese brand available at the Jap supermarket/NTUC Junction 8. Do you recommend the Phoon Huat green tea powder or the Japanese brand? Hi Hanushi, I strongly recommend the Japanese brand. I'm also a beginner baker and had a go at it yesterday, but didn't use milk powder as I had none. The buns turned out not too bad in taste-wise and look-wise although it didn't turn brown at all, just stayed pale green. I knead my dough by hand for 35 mins until it is not sticky anymore, but my buns are still doughy. by the way, to add to my earlier comment of my attempt to make this yesterday, there is no flour that is labeled as bread flour in the supermarket so I used wheat flour, and cold water. Hi there, bread flour has a 12-14% protein content, may be it is known as Strong flour over at your place. Using wheat flour or all purpose flour(plain flour) which has a lower protein content will not give a satisfactory result for this recipe. You need the gluten in the flour to make bread. Your buns look amazing! I love the color and their great shape. You are not only talented in cooking, but also in taking photos. I have no idea whether I can find green tea powder, other than the green tea satchels/boxes.